We’ve all been there—the moment a friend says, “No, it’s fine,” when their tone of voice says otherwise. Or how about when you’re irritated and want something, so communicate with others by subtly mentioning that you’re feeling so and so— or worse, give them the cold shoulder, until they magically read your mind and know what you need? Being passive aggressive is an art form, and contrary to popular belief, it is not just found in teenagers. We can all be passive aggressive when we want something but refuse to healthily and proactively assert our needs. We tend to be passive aggressive in our words or actions when we need vindication, feel threatened, or are too scared to speak up. It is a way or giving ourselves power in a situation where we want or need it. For instance, someone might keep the pecking order of popularity in the workplace by excluding you from a function or lunch. This action (or inaction) sends the clear message that they hold the power, and you are somehow lacking. And you may even see it online when people speak vaguely about their pain, or throw people metaphorically under the bus after acting like everything is fine in real life. Likes and comments go a long way when we need a dopamine rush to prove that we are not inferior or have been hard done by. On the outset, being passive aggressive seems to serve people well when they get what they want, however over the long term it ruins relationships, burdens the people around you, and keeps negativity and toxic energy locked inside you. So, are you passive aggressive? Purposeful or not, we can all fall in these unhealthy habits when we feel insecure. Here are six ways you can stop—or prevent yourself from, being passive aggressive in everyday life. Are you hungry? Tired? Annoyed? Maybe you just need a pen and your colleague is so focused on work they can’t be bothered grabbing an extra one for you? Stop expecting everyone else to read your mind and ask for what you need. Sometimes it will be as simple as proactively getting up and doing the activity yourself. Giving someone the cold shoulder until they ‘get the message’ is not healthy. Your pain or annoyance is valid, and they may not be pulling their weight, but silence just increases the divide between you rather than minimising it. Start talking about things instead. We all have a need to fit in and belong somewhere, which is why exclusion is one of the most powerful forms of passive aggression. You can’t dictate what you’re included in, but you do have the power to establish a culture of inclusion in your home, work and family by inviting everyone. Take the person you never speak to out for coffee, give them a smile, or send a Christmas card to a relative who feels on the outs. This is easier said than done, but one of frequent places we see passive aggressive tendencies is on social media. If you have strong feelings—be it a fit of rage, anger, a sense of injustice, feelings of isolation, grief or sadness, try and wait 24 hours before you post about it online. By publishing these things on the web, we’re looking for immediate validation and vindication. But the dopamine response you get is only temporary and you will find yourself craving more. This is why it’s easy to take a ‘martyr’ complex online, no matter how justified you may be. You deserve to have your feelings recognised in a safe space, where you can healthily communicate what you need and why. This needs to happen in person, so allow yourself the time to think about if and why you are posting these things before you press ‘send’. Passive aggression thrives on other people feeling disempowered, and demands their attention and energy without consent. One way to break this cycle is to keep yourself from responding to messages, emails and phone calls that aren’t urgent. By doing this, you communicate that you are in charge of your own space, time and energy and long term, hopefully this will keep the person on the other end from perpetuating this demanding behaviour. Take one day and put your expectation of others to the side. If you stop expecting people to chase you up, make you a meal, clean, pay the bills, ask how you are or pay for you—what would change? It’s natural for us to do things for the people we love, but when we begin to expect it we take them for granted and put ourselves in a position of power. This will grate on the people you love and feed your own ego—neither of which turns out well in the long run. Do you struggle with passive aggressive tendencies? 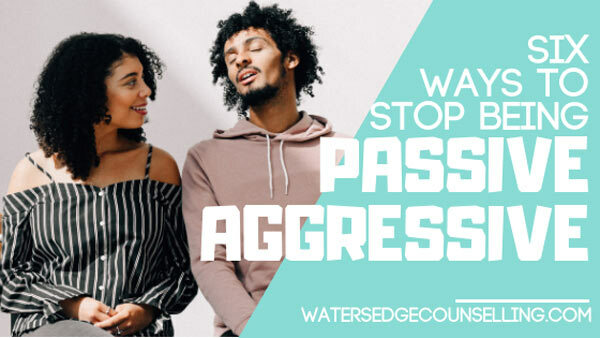 Do you have a loved one or partner who uses passive aggression to get what they want? Here’s what you need to do: Contact Colleen on 0434 337 245, Duncan on 0434 331 243 or Rachel on 0422 177 193 for a FREE 10 minute consultation on how we can best help you or book online .